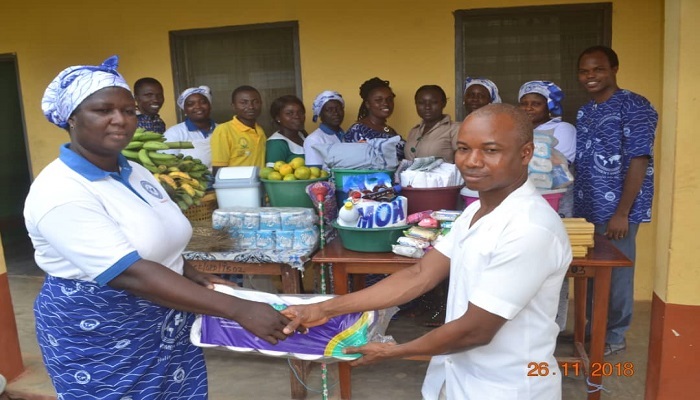 The Sekesua District Women’s Ministry in the Agormanya Area of The Church of Pentecost has donated some items to patients and staff of the Sekesua Clinic. The presentation was part of the Ministry’s commitment to demonstrating God’s love to the society. The items, worth GH¢850.00, included toiletries, bed sheets, pillow cases, brooms, buckets, napkins and fruits. Speaking at the brief presentation ceremony, the District Women’s Ministry Leader, Deaconess Esther Mawuley, said the gesture formed part of their social responsibilities to the community. An official of the clinic, Mr. Stanley Nkaku, who received the items on behalf of the patients and the staff, expressed their profound gratitude to the Church for their benevolence. Mr. Nkaku noted that the items would go a long way to benefit the patients and the facility at large. He called on the Church to continually support the clinic in order to provide the needed health care services to the people. Present at the ceremony were the Sekesua District Minister, Overseer Robert Asamoah and the wife Esther, as well as members of the Women’s Ministry.